James Robinson "Robbie" Risner (January 16, 1925 – October 22, 2013) was a general and a fighter pilot in the United States Air Force. During the Vietnam War, Risner was a double recipient of the Air Force Cross, the second highest military decoration for valor that can be awarded to a member of the United States Air Force, awarded the first for valor in aerial combat and the second for gallantry as a prisoner of war of the North Vietnamese for more than seven years. He was the first living recipient of the medal. Risner became an ace in the Korean War and commanded a squadron of F-105 Thunderchiefs in the first missions of Operation Rolling Thunder in 1965. He flew a combined 163 combat missions, was shot down twice, and was credited with destroying eight MiG-15s. Risner retired as a brigadier general in 1976. At his death, Air Force Chief of Staff General Mark A. Welsh III observed: "Brig. Gen. James Robinson "Robbie" Risner was part of that legendary group who served in three wars, built an Air Force, and gave us an enduring example of courage and mission success... Today's Airmen know we stand on the shoulders of giants. One of 'em is 9 feet tall... and headed west in full afterburner." Risner was born in Mammoth Spring, Arkansas, in 1925, but moved to Tulsa, Oklahoma, in 1931. His father was originally a sharecropper, then during the Great Depression became a day laborer for the Works Progress Administration. By the time Risner entered high school, his father was self-employed, selling used cars. Risner worked numerous part-time jobs in his youth to help the family, including newspaper delivery, errand boy and soda jerk for a drug store, for the Tulsa Chamber of Commerce at age 16, as a welder, and for his father polishing cars. Risner had a religious upbringing as a member of the 1st Assembly of God Church. He wrestled for Tulsa Central High School, where he graduated in 1942. In addition to a love of sports, Risner's interests were primarily in riding horses and motorcycles. Risner enlisted in the United States Army Air Forces as an aviation cadet in April 1943 and attended flight training at Williams Field, Arizona, where he was awarded his pilot wings and a commission as 2nd Lieutenant in May 1944. He completed transition training in P-40 Warhawk and P-39 Airacobra fighters before being assigned to the 30th Fighter Squadron in Panama. The 30th FS was based on a primitive airstrip without permanent facilities at Aguadulce, on the Gulf of Panama. Risner noted to a biographer that his tour under these conditions amounted to as much flying as he desired but a distinct lack of discipline on the ground. When the squadron was relocated to Howard Field in the Panama Canal Zone in January 1945 to transition to P-38 Lightning fighters, its pilots were soon banned from the Officers Club for rowdiness and vandalism. In 1946, Risner was involved in an off-duty motorcycle accident. While undergoing hospital treatment in the Army, he met his first wife, Kathleen Shaw, a nurse from Ware Shoals, South Carolina. Risner and Shaw became engaged on a ship and were discharged and married the next month. In civilian life, Risner tried a succession of jobs, training as an auto mechanic, operating a gas station, and managing a service garage. He also joined the Oklahoma Air National Guard, becoming a P-51 Mustang pilot and flew nearly every weekend. On one occasion, Risner became lost in the fringes of a hurricane on a flight to Brownsville, Texas. Forced to land on a dry lakebed, he found that he was in Mexico and encountered bandits, but successfully flew his Mustang to Brownsville after the storm had passed. He received an unofficial rebuke from the American embassy for flying an armed fighter into the sovereign territory of a foreign nation, but for diplomatic reasons, the flight was officially ignored. Risner was recalled to active duty in February 1951 while assigned to the 185th Tactical Fighter Squadron of the OKANG at Will Rogers Field in Oklahoma City, Oklahoma. He subsequently received training in the F-80 Shooting Star at Shaw Air Force Base, South Carolina. Risner's determination to be assigned to a combat unit was nearly ended when on his last day before going overseas he broke his hand and wrist falling from a horse. Robinson deliberately concealed the injury, which would have grounded him, until able to convince a flight surgeon that the injury had healed. He actually had his cast removed to fly his first mission. Risner arrived in Korea on May 10, 1952, assigned to the 15th Reconnaissance Squadron at Kimpo Air Base. In June, when the 336th Fighter-Interceptor Squadron, also at Kimpo, sought experienced pilots, he arranged a transfer to 4th Fighter Wing through the intervention of a former OKANG associate. Risner was often assigned to fly F-86E-10, AF serial no. 51-2824, nicknamed Ohio Mike and bearing a large cartoon rendition of Bugs Bunny as nose art, in which he achieved most of his aerial victories. His first two months of combat saw little contact with MiGs, and although a flight leader, he took a three-day leave to Japan in early August. The day after his arrival, he returned to Korea when he learned that MiGs were operational. Arriving at Kimpo in the middle of the night, he joined his flight which was on alert status. The flight of four F-86 Sabres launched and encountered 14 MiG-15s. In a brief dogfight, Risner shot down one to score his first aerial victory on August 5, 1952. On the return flight, Risner's wingman, 1st Lt. Joseph Logan, was struck in his fuel tanks by anti-aircraft fire over Antung. In an effort to help him reach Kimpo, Risner attempted to push Logan's aircraft by having him shut down his engine and inserting the nose of his own jet into the tailpipe of Logan's, an unprecedented and untried maneuver. The object of the maneuver was to push Logan's aircraft to the island of Cho Do off the North Korean coast, where the Air Force maintained a helicopter rescue detachment. Jet fuel and hydraulic fluid spewed out from the damaged Sabre onto Risner's canopy, obscuring his vision, and turbulence kept separating the two jets. Risner was able to re-establish contact and guide the powerless plane out over the sea until fluids threatened to stall his own engine. Near Cho Do, Logan bailed out after calling to Risner, "I'll see you at the base tonight." Although Logan came down close to shore and was a strong swimmer, he became entangled in his parachute shrouds and drowned. Risner shut down his own engine in an attempt to save fuel, but eventually his engine flamed out and he glided to a deadstick landing at Kimpo. On September 21, he shot down his fifth MiG, becoming the 20th jet ace. In October 1952 Risner was promoted to major and named operations officer of the 336th FIS. Risner flew 108 missions in Korea and was credited with the destruction of eight MiG-15s, his final victory occurring January 21, 1953. Risner was commissioned into the Regular Air Force and assigned to the 50th Fighter-Bomber Wing at Cannon Air Force Base, Clovis, New Mexico, in March 1953, where he became operations officer of the 81st Fighter Bomber Squadron. He flew F-86s with the 50th Wing to activate Hahn Air Base, West Germany, where he became commander of the 81st FBS in November 1954. In July 1956, he was transferred to George Air Force Base, California as operations officer of the 413th Fighter Wing. Subsequently, he served as commander of the 34th Fighter-Day Squadron, also at George Air Force Base. During his tour of duty at George Air Force Base, Risner was selected to fly the Charles A. Lindbergh Commemoration Flight from New York to Paris. Ferrying a two-seat F-100F Super Sabre nicknamed Spirit of St. Louis II to Europe on the same route as Lindbergh, he set a transatlantic speed record, covering the distance in 6 hours and 37 minutes. From August 1960 to July 1961, he attended the Air War College at Maxwell Air Force Base, Alabama. He next served on the joint staff of Commander-in-Chief, Pacific (CINCPAC) in Hawaii. 67th TFS Republic F-105D-25-RE Thunderchief 61-0217. On 16 September 1965 Risner was flying this aircraft when he was shot down by anti-aircraft artillery. On April 3 and 4, 1965, Risner led two large missions against the Thanh Hóa Bridge in North Vietnam. On the afternoon of April 3, the strike package of Rolling Thunder Mission 9 Alpha consisted of 79 aircraft, including 46 F-105s. 16 of those carried AGM-12 Bullpup missiles, while another 30 carried eight 750-pound bombs each, half of which were designated for the railroad and highway bridge. The force had clear conditions but encountered a severe glare in the target area that made the bridge difficult to acquire for attacks with the Bullpups. Only one Bullpup could be guided at a time, and on his second pass, Risner's aircraft took a hit just as the missile struck the bridge. Fighting a serious fuel leak and a smoke-filled cockpit in addition to anti-aircraft fire from the ground, he again nursed his crippled aircraft to Danang. The use of Bullpups against the bridge had been completely ineffectual, resulting in the scheduling of a second mission the next day with 48 F-105s attacking the bridge without destroying it. The missions saw the first interception of U.S. aircraft by North Vietnamese MiG-17 fighters, resulting in the loss of two F-105s and pilots of the last flight, struck by a hit-and-run attack while waiting for their run at the target. Risner's exploits earned him the award of the Air Force Cross and resulted in his being featured as the cover portrait of the April 23, 1965 issue of Time magazine. The 67th TFS ended its first deployment to Korat on April 26 but returned from Okinawa on August 16 for a second tour of combat duty over North Vietnam. On August 12, 1965, U.S. Air Force and Navy air units received authorization to attack surface-to-air missile sites supplied to the North Vietnamese by the Soviet Union. Initial attempts to locate and destroy the SA-2 Guideline sites, known as Iron Hand missions, were both unsuccessful and costly. Tactics were revised in which "Hunter-Killer Teams" were created. Employed at low altitudes, the "hunters" located the missiles and attacked their radar control vans with canisters of napalm, both to knock out the SAM's missile guidance and to mark the target for the "killers", which followed up the initial attack using 750-pound bombs to destroy the site. "We were lucky to have Risner. With (Captain James) Stockdale we had wisdom. With Risner we had spirituality." After several days of travel on foot and by truck, Risner was imprisoned in Hỏa Lò Prison, known as the Hanoi Hilton to American POWs. However, after two weeks he was moved to Cu Loc Prison, known as "The Zoo", where he was confronted during interrogations with his Time magazine cover and told that his capture had been highly coveted by the North Vietnamese. Returned to Hỏa Lò Prison as punishment for disseminating behavior guidelines to the POWs under his nominal command, Risner was severely tortured for 32 days, culminating in his coerced signing of an apologetic confession for war crimes. Risner spent more than three years in solitary confinement. Even so, as the officer of rank with the responsibility of maintaining order, from 1965 to 1973 he helped lead American resistance in the North Vietnamese prison complex through the use of improvised messaging techniques ("tap code"), endearing himself to fellow prisoners with his faith and optimism. It was largely thanks to the leadership of Risner and his Navy counterpart, Commander (later Vice Admiral) James Stockdale, that the POWs organized themselves to present maximum resistance. While held prisoner in Hỏa Lò, Risner served first as Senior Ranking Officer and later as Vice Commander of the provisional 4th Allied Prisoner of War Wing. He was a POW for seven years, four months, and 27 days. His five sons had been ages 3 to 16 when he was shot down and imprisoned. To make it, I prayed by the hour. It was automatic, almost subconscious. I did not ask God to take me out of it. I prayed he would give me strength to endure it. When it would get so bad that I did not think I could stand it, I would ask God to ease it and somehow I would make it. He kept me. Risner was promoted to colonel after his capture, with a date of rank of November 11, 1965. He was part of the first group of prisoners released in Operation Homecoming on 12 February 1973 and returned to the United States. In July 1973 USAF assigned him to the 1st Tactical Fighter Wing at MacDill Air Force Base, Florida, where he became combat ready in the F-4 Phantom II. Risner was later transferred to Cannon Air Force Base, New Mexico in February 1974 to command the 832d Air Division, in which he flew the F-111 Aardvark fighter-bomber. He was promoted to brigadier general in May 1974. On 1 August 1975, he became Vice Commander of the USAF Tactical Fighter Weapons Center at Nellis Air Force Base, Nevada and retired from the Air Force on 1 August 1976. Risner's family life during and following his imprisonment was marked by several personal tragedies. His mother and brother died while he was still a P.O.W. and his oldest son, Robbie Jr., died two years after his return of a congenital heart defect. In June 1975, Risner was divorced from his wife Kathleen after 29 years of marriage. In 1976, he met his second wife, Dorothy Marie ("Dot") Williams, widow of a fighter pilot missing-in-action in 1967, and subsequently married her after her missing husband was declared dead. They remained married until the end of his life, with the two younger of his four surviving sons choosing to live with him and Risner adopting her three youngest children. After retirement he lived in Austin, Texas, where he worked with the D.A.R.E. program and raised quarter horses, and later in San Antonio. He later moved to Bridgewater, Virginia. A nine-foot bronze statue of Risner, sculpted by Lawrence M. Ludtke and mounted on a five-foot pedestal of black granite, was commissioned by Perot and dedicated in the Air Gardens at the Air Force Academy on November 16, 2001. In addition to replicating the Risner Award, the statue commemorates Risner and other POWs who were punished for holding religious services in their room at the Hanoi Hilton on February 7, 1971, in defiance of North Vietnamese authorities. The statue was made nine feet tall in memory of Risner's statement, commenting on his comrades singing The Star Spangled Banner and God Bless America, that "I felt like I was nine feet tall and could go bear hunting with a switch." Perot helped Risner later become the Executive Director of the Texans' War on Drugs, and Risner was subsequently appointed by President Ronald Reagan as a United States Delegate to the fortieth session of the United Nations General Assembly. He was also inducted into the Oklahoma Hall of Fame in November 1974 in recognition of his military service, and announced as an inductee into the Arkansas Military Veterans Hall of Fame on November 1, 2013. In 2006, Risner appeared on an episode of the History Channel series Dogfights. In the episode, titled 'MiG Alley', Risner's "August 5 and September 15, 1952 missions", actions is depicted. The episode was the first episode of the first season of the series, which recreated historical air combat campaigns using modern computer graphics. On October 19, 2012, ground was broken at the Air Force Academy for its new Center for Character and Leadership Development. In February 2012 the Academy received a $3.5 million gift from The Perot Foundation to endow the General James R. Risner Senior Military Scholar at the center, who "will conduct research to advance the understanding, study and practice of the profession of arms, advise senior Academy leadership on the subject, and lead seminars, curriculum development, and classroom activities at the Academy." 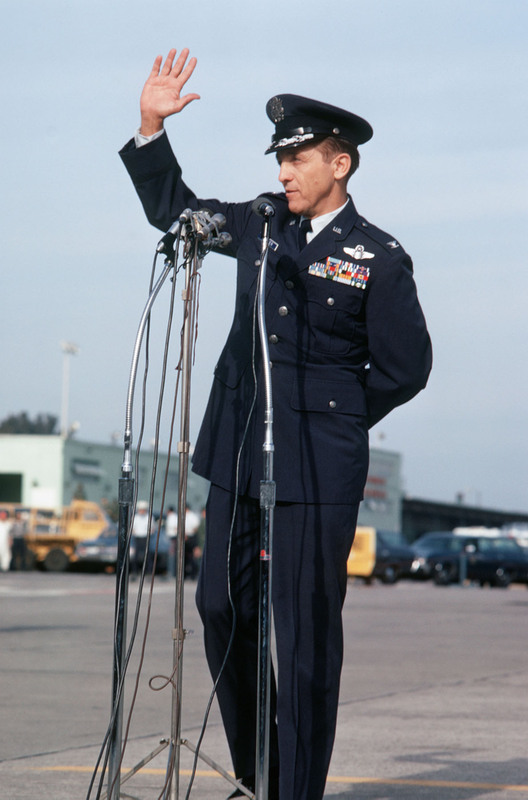 The chapter squadron of the Arnold Air Society for Southern California, based on the AFROTC detachment of California State University, San Bernardino, is named for Risner. Risner was inducted into the Arkansas Aviation Hall of Fame by the Arkansas Aviation Historical Society in 2015. On 10 March 2018, Risner was named the Exemplar for the United States Air Force Academy's Class of 2021. Risner died in his sleep October 22, 2013, at his home in Bridgewater, Virginia three days after suffering a severe stroke. Risner was buried at Arlington National Cemetery on January 23, 2014. He was eulogized by Perot and General Welsh with fellow former POWs and current members of the 336th Fighter Squadron among those in attendance. The President of the United States, authorized by Title 10, Section 8742, United States Code, takes pleasure in presenting the Air Force Cross to Robinson Risner, Lieutenant Colonel, U.S. Air Force, for extraordinary heroism in connection with military operations against an opposing armed force on 3 and 4 April 1965. On these dates Colonel Risner led two successive operations against vitally important and heavily defended targets. Performing in the role of air coordinator, Colonel Risner arrived over the target area before the main strike force, evaluated the effectiveness of each strike, redirected subsequent strikes, and provided flak suppression against defenses that would hinder delivery aircraft in the performance of their mission. On the initial attack, while exposing himself to heavy ground fire, with complete disregard for his personal safety, Colonel Risner's aircraft sustained a direct hit in the left forward bomb-bay area, filling the cockpit with smoke and fumes. He flew his badly damaged aircraft over heavily fortified hostile territory before successfully landing at a friendly airfield. On 4 April, he again led an attacking force of fighter aircraft on a restrike against the same target. Colonel Risner initiated the attack, directing his aircraft into the target in the face of heavy automatic ground fire. His aerial skill and heroic actions set an example for the others to follow. In the course of the operation, Colonel Risner's unit encountered the first MIG force committed in aerial combat against the U.S. Forces in Southeast Asia. However, he refused to be diverted from his primary mission of completing the destruction of the assigned targets. Colonel Risner's actions not only deprived the communist force of its vital supply route and much needed equipment but further served to emphasize the high degree of U.S. determination in Southeast Asia. Through his extraordinary heroism, superb airmanship and aggressiveness, Colonel Risner reflected the highest credit upon himself and the United States Air Force. The President of the United States, authorized by Title 10, Section 8742, United States Code, takes pleasure in presenting a Bronze Oak Leaf Cluster in lieu of a Second Award of the Air Force Cross to James Robinson Risner, Lieutenant Colonel, U.S. Air Force, for extraordinary heroism in military operations against an opposing armed force while a Prisoner of War in North Vietnam from 31 October to 15 December 1965. Through his extraordinary heroism and willpower, in the face of the enemy, Lieutenant Colonel Risner reflected the highest credit upon himself and the United States Air Force. ^ The downed aircraft was the first F-105 lost to hostile fire in Southeast Asia, but the pilot, Capt. Albert C. Vollmer, was rescued. ^ In 1965 the facilities at Korat RTAFB were still primitive and the Air Force living area was referred to as "Camp Nasty." ^ Five USAF aircraft, including three of Risner's F-105s, were shot down on the Xom Biang strike, but all of the 67th TFS pilots including Baird were rescued. ^ a b "Eagle Biography Robinson 'Robbie' Risner". Gathering of Eagles Foundation. Retrieved 30 October 2013. ^ a b c d Sherwood (1998), p. 14. ^ a b c Baird and Goble (1994), p. 484. ^ a b Sherwood (1998), p.15. ^ Sherwood (1998), p. 16. ^ a b c Werrell (2005), p. 205. ^ a b Thompson (2006), p. 29. ^ Davis (1978), p. 43. ^ a b c d Werrell (2005), p. 206. ^ Frisbee, "Valor: When Push Came to Shove"
^ Thompson (2006), p. 86. ^ Thompson and McLaren (2002), p. 183. ^ a b c d e f "Brigadier General Robinson Risner". Air Force Link. Retrieved 5 April 2016. ^ "Risner, Robinson". Aeroweb History. Archived from the original on 21 September 2002. Retrieved 28 January 2009. ^ a b Correll, "Nine Feet Tall"
^ Morrocco and Manning (1984), pp. 51–51. ^ Morrocco and Manning (1984), p.53. ^ Campbell and Hill (1996), p. 90. ^ Lavalle (1985), pp. 32–38. ^ Morrocco and Manning (1984), p. 110. ^ a b Morrocco and Manning (1984), p. 111. ^ "CNN.Com Transcripts Larry King Live". CNN. 2001-02-07. Retrieved 30 January 2009. Interview with Risner on December 14, 2001. ^ a b Langgruth (2001), pp. 389–390. ^ a b Hobson (2001), p. 32. ^ "Vice Admiral James Bond Stockdale: Vietnam War Hero and Indomitable Spirit at the Hanoi Hilton". History Net. Retrieved 30 January 2009. ^ Kiley and Rochester (1999), p. 162. ^ a b Howes (1993), pp. 107–108. ^ a b Kiley and Rochester (1999), p. 183. ^ Risner (1973), pp. 173–175. ^ McCarthy, "On Colonel Risner"
^ Kiernan (2002), pp. 602–605. ^ Grumbach, "The Art of Reviewing By Innuendo"
^ Fallows, "The Blinders She Wears"
^ "USAF Weapons School Robbie Risner Award" (PDF). Texas A&M Class of '66. 42 (1): 6. 2008. Retrieved 30 October 2013. ^ "Room 7, Hanoi Hilton". Nam POWs. Retrieved 28 January 2009. ^ Ronald Reagan Presidential Library Archives (1985). "Nomination of United States Representatives and Alternate Representatives to the 40th Session of the United Nations General Assembly". University of Texas. Retrieved 30 January 2009. ^ The Brigadier General James Robinson Risner Squadron. Retrieved 25 October 2013. ^ "James Robinson Risner". Veteran Tributes. Archived from the original on 3 April 2009. Retrieved 1 February 2009. Correll, John T. (2012). "Nine Feet Tall". Air Force Magazine. Vol. 95 no. 2. pp. 74–78. Retrieved 30 October 2013. Frisbee, John (1998). "Valor: When Push Came to Shove". Air Force Magazine. Vol. 81 no. 5. p. 114. Retrieved 1 February 2009. McCarthy, Mary (7 March 1974). "On Colonel Risner". New York Review of Books. Tillman, Lynn (2000). "Frances Kiernan". BOMB. 71 (Spring). Retrieved 30 October 2013. Van Staaveren, Jacob (2002). Gradual Failure: The Air War Over North Vietnam 1965–1966. Air Force History and Museums Program. This page was last edited on 14 April 2019, at 19:03 (UTC).